If ever there was a brand that screams luxury, it's Jo Malone. I adore the classic cream and black packaging that is featured on the bottles, bags and boxes and the scent combinations make the brand unique and special. I am lucky enough to have built up quite a collection (thanks to my generous husband and savings in Duty Free!) and I wanted to share it with you today! Cologne: This range of fragrances is available in 30ml and 100ml bottles and I am lucky enough to have a number of each. Jo Malone fragrances can be layered/combined to tailor the scent to your personal taste but that's an expensive habit! 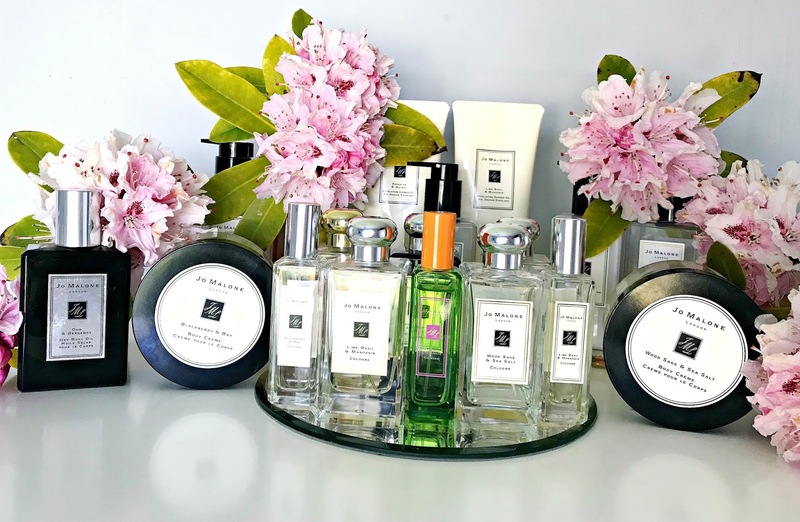 The most famous Jo Malone scent combination is Lime, Basil and Mandarin, which happens to be my favourite because it is so invigorating and zesty, yet the basil tones the sharpness down a little. If I'm feeling particularly extravagant, I like to combine it with Wood Sage & Sea Salt, which is a fresh scent that balances the zestiness - the result of this combination is an uplifting fragrance. I know that a lot of people love Pomegranate Noir, but I personally am not a fan as I find it to be too spicy - all I can smell is cloves, which remind me of toothaches! Blackberry & Bay is a fruity scent but it is't overly sweet due to the Bay, which sharpens it slightly. Orange Blossom is a subtle citrus scent that is unlike other citrus fragrances because it has a warm and almost powdery undertone. Orange Bitters was a limited edition fragrance at Christmas and it's a woody, citrusy scent. I recently reviewed Tropical Cherimoya Cologne here, which is a limited edition summer fragrance. As I said in the review, I personally prefer the original packaging but this is a summer scent and the limited edition packaging reflects that. Cologne Intense: The intense version of the Colognes are richer, have more depth and last longer on the skin. I have Velvet Rose & Oud, which is not a traditional rose scent as it's a musky, smoky scent mixed with rich roses. It's warm, sensual and smells expensive! The Cologne Intense fragrances are available in 50 and 100ml bottles. Hand & Body Wash: I really like these shower gels because they foam well but they aren't drying on the skin despite being perfumed. The aroma fills the room with just 1-2 pumps and when I'm going all out, I will use this and the corresponding body lotion, combined with the fragrance to extend the wear time. I have Basil & Neroli and Lime, Basil & Mandarin. Basil & Neroli is a floral/citrusy/spicy fragrance - a nice alternative to Lime, Basil & Mandarin if that one is too zesty for your personal taste. Exfoliating Shower Gel: This is ok to use for a light daily exfoliation but it wouldn't replace a traditional body scrub for me and wouldn't remove remnants of fake tan. For extremely smooth and soft skin, I would recommend their Geranium & Walnut Body Scrub, which is one of the best body scrubs I have ever used - skin is literally left baby soft after using this. Bath & Shower Oil: These oils are for when I'm feeling particularly decadent or in need of a pamper as the scent fills the room but the oil also moisturises my skin. Only 1/2 capfuls are needed so the bottle really does last a long time. I have Lime Basil & Mandarin (can you sense a theme?) and Nectarine Blossom & Honey. I used to own the cologne in this scent but it's a little too sweet for my liking, however in a bath oil, it's more subtle and it leave my skin lightly fragranced. Hand & Body Lotion: Usually, perfumed body lotions are drying on the skin but that's not the case with the Jo Malone Hand & Body Lotions. I find that they are moisturising and fast absorbing and my skin is left soft, nourished but not greasy when I use them. Go on - take a guess at which fragrance I have? Yes, got it in one - Lime, Basil & Mandarin! These come in 100 and 250ml bottles, with the 100ml priced at £20 making it a great way to try a scent or the brand without spending too much, I think these also make great gifts as they are luxury treats that people might not necessarily spend the cash on themselves. Dry Body Oil: I love a body oil and, particularly, a dry body oil as I don't have to wait around for it to absorb before getting dressed. These are only available in the Cologne Intense scents and I have Oud & Bergamot, which is quite masculine and to my nose, quite Christmassy due to how strong the Oud is. I find that this fragrance lasts a good 6/7 hours on my skin and the oil itself keeps my skin soft but not greasy. Body Cream: I have two of these in the following scents: Wood Sage & Sea Salt and Blackberry & Bay. Surprisingly, I don't find these to be as nourishing as the Hand & Body Lotion and they take a bit more work to massage into the skin. That said, the extra effort is worth it because the scent lingers on the skin for hours and extends the wear time of the colognes when the matching scents are worn. I have also hand some candles in the past and the first one really disappointed me because it didn't seem to give to give off much scent but when I got the second one, I realised that maybe it was just that particular scent was subtle (Orange Blossom) as the next one I had (Pine & Eucalyptus) filled the room with fragrance. They are expensive, like everything else from the brand, so for me they would be a real treat or a special gift but if I ever win the lotto, my house will be filled with their candles and diffusers! A few times a year on the Jo Malone site, they run a promotion where you can get a free full size gift with a purchase over £45. I've availed of this twice and it's a great way to try more products from the brand without spending any extra. It's worth keeping an eye on the site for that! Are you a fan of Jo Malone? Which is your favourite scent combination? I'd love to hear!